Posted by: Ash on March 6th, 2016, in Guides. Tags: Ecuador, Top Attractions. Here is our selection of the top 16 tourist attractions in Ecuador. We will provide information on each attraction and mention some travel bloggers to give you their own opinions of each place. The Ecuadorian Amazon Rainforest ranks as the most wildlife-rich area on Earth and contains an astounding number of animals and plants. Rare for the northern Amazon, in Ecuador you can also see some clay licks where flocks of colorful parrots visit muddy banks for the nutrient and salt rich clays. 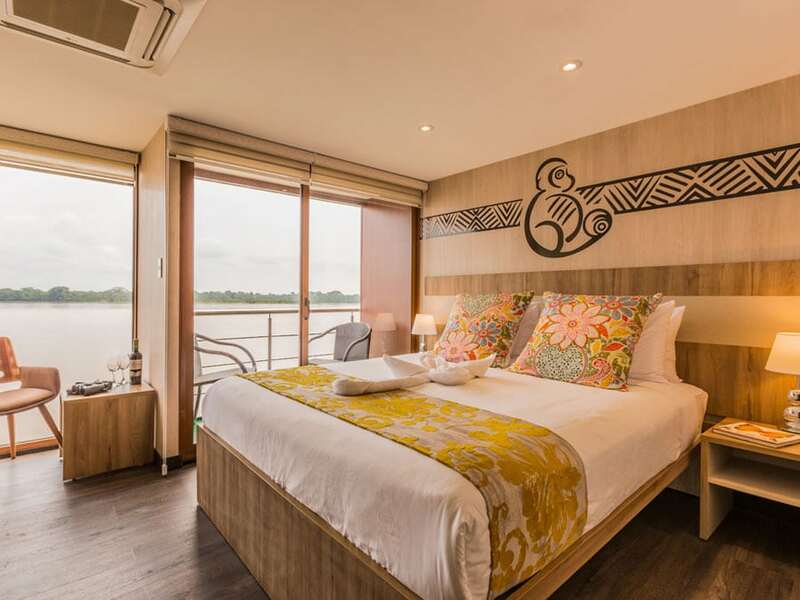 From a number of excellent rainforest lodges or Amazon River cruises, you will head out with your professional guide to spot the many different species, such as several different monkeys, colorful birds, fascinating reptiles, and a diversity of delicate frogs. 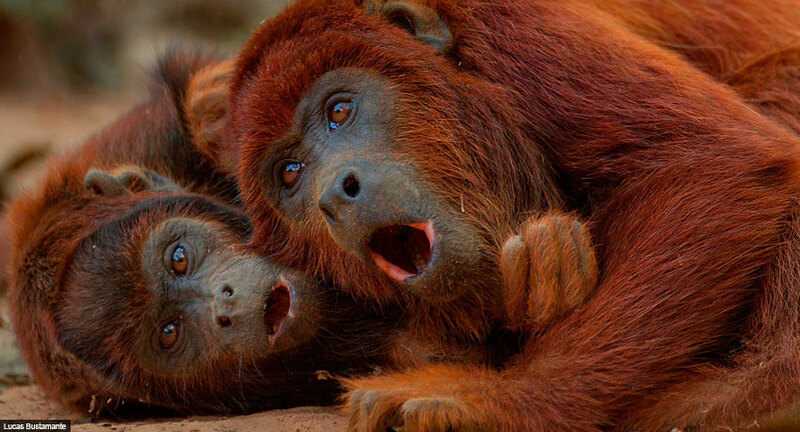 The monkeys you’re likely to find include squirrel monkeys, capuchins, howler monkeys, sakis, and spider monkeys. The main protected areas in Ecuador’s Amazon Rainforest are the Yasuni National Park and the Cuyabeno Reserve. These areas contains a fantastic amount of wildlife and there are rainforest corridors linking the rainforest so animals including jaguar, monkeys, and tapir can cross from one reserve to the other. 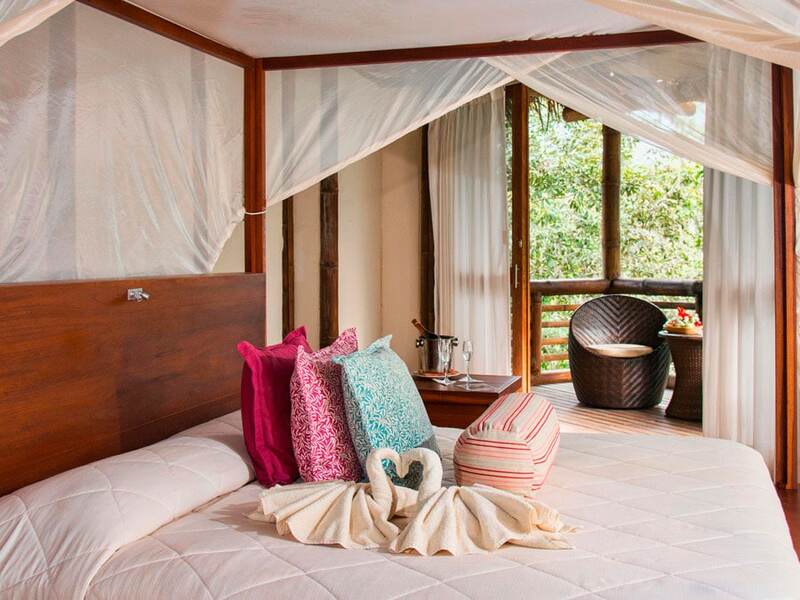 Enjoy large canopy towers from different lodges to gaze over the Amazon. These are great spots for seeing different birds flying high over the forest. 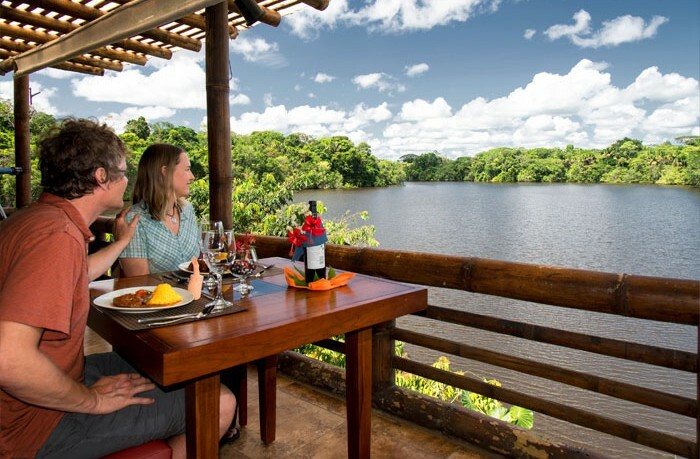 At the highly acclaimed Sacha Lodge, you can enjoy their giant canopy walkway high above the Amazon, which is much loved by tourists and especially by bird watchers. 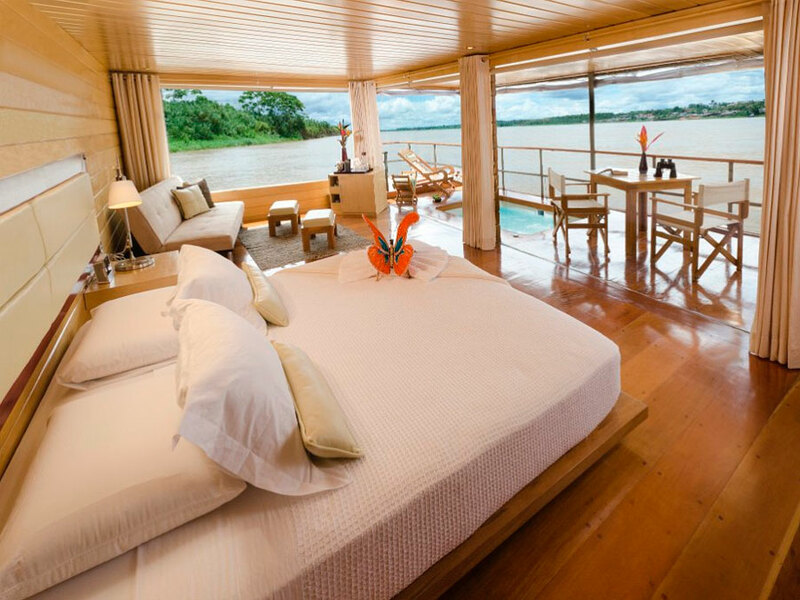 The Ecuadorian Amazon Rainforest has some great luxury Amazon tours, such as the excellent & luxurious La Selva Lodge, the community owned Napo Wildlife Center or the Anakonda Luxury Cruise. If community owned lodges are your preference, which are the most beneficial to the environment and communities in the rainforest another great option is the highly regarded Sani Lodge. Sitting just off the coast of Ecuador, the Galapagos Islands have fascinated people since the 1800s when Charles Darwin made his notes on the archipelago’s unique collection of animals and plants. Darwin’s notes on the Galapagos helped him develop the theory of evolution by natural selection, as he noted the different finches inhabiting the islands had adapted to suit the island’s particular food available. On tours of the Galapagos, you can see tortoises the size of small vehicles, blue footed boobies, ocean diving iguanas, sea lions, flamingos, and a diversity of others. Enjoy touring some of the the 19 various islands to enjoy fascinating nature, geological spectacles, beautiful beaches, and interesting history. A great stop over common to many tours is the Charles Darwin Research Center where researchers are studying the local wildlife and conservation programs are undertaken to help different species, such as the iconic giant tortoises. Enjoy Galapagos cruises to experience each island’s unique story and visit the best places for wildlife viewing. Because of the sensitive environment, we recommend choosing responsible tours and there are even some luxury Galapagos cruise options to choose from, such as the Cormorant Galapagos Cruise, Ocean Spray, or Petrel Galapagos Cruise. Our recommendations are the Galapagos catamarans as they offer a little more stability at sea, but there are even some responsible Galapagos hotels offering wildlife tours on the islands themselves. Enjoy short tours of a few days to get a taste of the Galapagos Islands right through to two week mega-cruises to explore the archipelago in detail. As a wonderful add-on experience we highly recommend a combination tour of the Galapagos and Amazon. 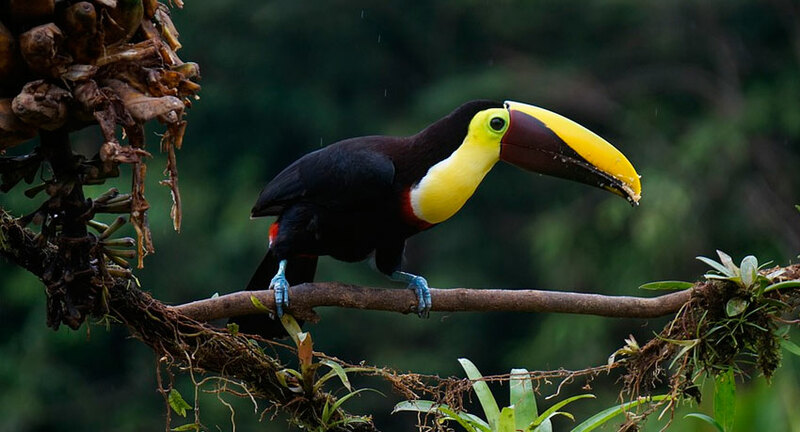 To combine experiences, you can customize the tour yourself or choose the luxury Amazon & Galapagos package for a 9 day Ecuadorian nature vacation in responsible high-class luxury. Founded in the 16th century, Quito is Ecuador’s capital and a great example of a South American colonial city. Originally built on the ruins of an old Inca city, Quito offers some fascinating architecture, great restaurants, comfortable cafes, and fascinating museums. Located in the Andes surrounded by mountains, Quito’s main attraction is Old Town, which is a UNESCO World Heritage Site filled with interesting colonial buildings, history, and monuments. Unlike many historic centers, this is a well used part of the city with frequently visited plazas and busy streets. The country’s name gives a clue to one of the favorite things to do while in Ecuador, as ecuador means equator in Spanish. Visitors can enjoy a trip to La Mitad del Mundo and you can take photographs at the equatorial line and tall 30 meter (100 ft) high monument. This is a little off the GPS coordinates for the equator, but don’t let that spoil the fun. The colonial architecture is best seen in the old Catholic churches, such as as the San Francisco Monastery, La Compañía (further down the list), and Santo Domingo Monastery. The Basílica del Voto Nacional is also a must see attraction, which is the largest Neo-gothic basilica in the Americas and you can climb right to the top of the tall tower. Hiking and walking opportunities can be found from various trails around the city. The closest volcano is Pichincha, and you’re also provided with a cable-car ride to the top with fantastic views. Inside the city itself, you can find Metropolitano Guanguiltagua Park, which is one of the largest city parks in South America. This is a great place to relax during the day. You’re sure to visit La Mariscal, which is affectionately known as Gringolandia. You can find many tourist focused restaurants, shops, travel agencies, cafes, hotels, and nightlife. Don’t forget market day on Sundays as you’re sure to encounter fascinating stalls filled with interesting Ecuadorian crafts, products, and food. Some travel bloggers who visited Quito are Jeff & Lindsay from Noapprovalneeded.com and Lars & Liane from Bobaroundtheworld.com. One of the favorite scenic hikes in Ecuador, the Quilotoa Loop not only offers stunning scenery but also cultural experiences with local people, markets, and villages. You will also have the crystal-blue Quilotoa Lake itself. This is one of the most beautiful lakes in Ecuador and makes for a fantastic visit. Many people regard this trek along with the Galapagos and Amazon as one of the country’s must-visit attractions. About three hours from Quito, this is a much-loved trail but it is off-the-beaten-track and an adventurous attitude may be required. The trek takes around five days if you take your time and you can stay in different accommodations on the way, which prepare your meals and provide maps to help you stay on track. The circuit is about 200km and if you want to finish at the lake itself, a great way to go is from north to south beginning in Sigchos and ending in Quilotoa. However, many people choose to go in the other direction as well. You will pass fantastic scenery, such as lakes, rivers, valleys, Quechua communities, as well as the fantastic volcano. From the rim of Quilotoa Laguna you can also see the beautiful snow capped peaks of Cotopaxi. Otavalo itself is an indigenous town in Ecuador and the most famous attraction here for visitors is the fantastic market. The indigenous Otavaleños are known for their weaving of Andean textiles and clothing, which are then sold in the market on Saturdays. You can choose from a variety of colorful and intricately patterned items, such as blankets, clothing, table cloths, a diversity of bags, ornaments, and jewelry. Dating from pre-Colombian times, the market continues today but took off in 1960 with a bustling community of buyers and sellers selling all types of novel items sourced from around the country. The market remains one of the most interesting in Latin America. Some of the surrounding towns then focus on other products, such as wood carving and leather and you can visit the different areas to browse what’s on offer. Famous for traditional and mixed textiles, tourism is now the town’s main industry and a focus is made on producing traditional handicrafts for the market. Some sellers also have success in selling their goods abroad and the Otavaleños are one of Latin America’s most commercially successful indigenous groups. Surrounded by fantastic scenery, it’s the people and landscape that add the the attraction of the market. The local people wear traditional clothing, such as colorful ponchos and traditional hats. Not only offering the famous Otavalo Market, you can also visit the nearby waterfall called Las Cascadas de Peguche and some attractive lakes. There are also different enjoyable activities nearby, such as mountain biking, horse riding, kayaking, and many different hiking opportunities. Some travel bloggers who visited Otavalo Market are Laura & Lance from Traveladdicts.net and Brenna from Thisbatteredsuitcase.com. Baños lives up to its name with steaming thermal pools you can visit. Sitting in an incredible environment of waterfalls, forests, and volcanoes, the area is worth a visit for its scenery alone. Baños de Agua Santa is a small Andean city backed by the Tungurahua volcano. Known as the adventure capital of Ecuador, in addition to the fantastic scenery you can enjoy many different activities, such as mountain biking, kayaking, rafting, and lively nightlife. The city is located in central Ecuador and is a tourist hub for visitors interested in the hot pools, the many different activities, and also for visiting the surrounding forests. Cuenca is a 16th century city in Ecuador’s highlands with the city center listed by UNESCO as a World Heritage Site. A favorite city in Ecuador, you can find many fantastic historical buildings with impressive architecture as well as a lot of other tourist attractions, such as churches, museums and attractive city parks. A favorite place for its cobblestone streets and colonial architecture, Cuenca is also a great place to browse traditional Ecuadorian products, such as ceramics, hats, and different crafts. You can enjoy international and traditional cuisine with many fantastic restaurants throughout the city. After the defeat of the Cañari who lived here beforehand, the Inca inhabited the area for a brief period but abandoned the region long before the Spanish arrival. You can find some Incan architecture dotted around the city as the Spanish built Cuenca on the ruins of the Inca’s ancient settlement. This is Ecuador’s third largest city and one of the country’s most significant colonial cities providing a cleaner and more relaxed vibe than the country’s capital of Quito. Surrounding Cuenca are great nature experience, such as visits to the impressive El Cajas National Park where you can walk, hike, and enjoy great mountain biking opportunities. Some travel bloggers who visited Cuenca are Mike & Anne from Honeytrek.com, Anna from Blondebananablog.com, and Brittany from Borealblonde.com. The Ecuadorian cloud forest is a remarkable environment home to one of the world’s highest levels of animals and plants. The birds here are incredibly diverse with a fantastic number of species. Enjoy hummingbirds, toucans, and other wildlife, such as various monkeys and mysterious-looking plants. Cloud forest is defined as forest at such a high altitude that it’s penetrated by cloud cover, which makes the lush forested sides of the Andes a great place for a range of wildlife rich areas. The varying altitudes create a fascinating diversity of wildlife and the cloud forest contains many different endangered species. The environment alone is one of the world’s most threatened. You will notice that the cloud forest is a lot more lush than the lower rainforest and offers a cooler temperature because of the higher altitude. The environment is unique with mosses covering the trunks of trees, fast moving rivers, orchids cling to the branches, and epiphytes dotting the tall trees. You can enjoy some fantastic cloud forest lodges in Ecuador and visit many different cloud forest reserves. From these unique accommodation options, enjoy guided walks through the cloud forest to learn about this incredible environment while spotting many of the different animals and plants that call this threatened forest home. A travel blogger who visited the cloud forest is Angela from Notyouraverageamerican.com. The name Cotopaxi is thought to mean ‘the neck of the moon’ and the volcano was once worshiped by ancient civilizations. This is one of the world’s highest active volcanoes and one of the most famous volcanoes in South America. Located just south of Quito, Cotopaxi is part of the Pacific Ring of Fire and an iconic landmark. The volcano has a beautiful form with a symmetrical volcano shape and snow covered top. Reaching 5897m (19,347ft) into the sky, Cotopaxi is the second highest peak in the country and sits in the middle of Ecuador’s most popular national park. The park protects the environment of the volcano itself and surrounding grasslands. The area around this impressive volcano is home to fantastic hiking trails where you can see different animals and plants, including the majestic condors, spectacled bear, and deer. The first European who attempted to climb the volcano was the famous explorer and naturalist Alexander von Humboldt, but he failed to reach the top. Nowadays you can enjoy horse riding around the volcano and hikes up the volcano itself. Not only offering a thrill of climbing a still very active volcano, the views from the top are breathtaking. Some travel bloggers who visited Cotopaxi are Brendon from Nerdtravels.com and Tammy & Chris from Tammyandchrisonthemove.com. One of the only buildings on this list, we have to add one of the most beautiful churches in South America. La Compañía is a Jesuit church in Quito and the central space is intricately decorated with gold leaf and ornate wood carvings making it such a fantastic building. The church even shows the subtle ways early Christians manipulated followers of indigenous beliefs to convert to Catholicism, as lining the entrance are images of the Sun and other highly revered symbols of indigenous people. Dating from 1605 and taking over 100 years to build, the outside of the church is topped with beautiful green and gold domes. Almost every inch of the church tells a story and the building providing a fantastic example of artistic expression. A must visit building and UNESCO World Heritage Site, La Compañía de Jesus offers both an architecturally beautiful and ornately decorated church fitted with fantastic artwork, sculptures, and altars. Enjoy tours around the church that show off the building’s unique history and architecture. Some travel bloggers who visited La Compañía de Jesus Church are Jeff & Lindsay from Noapprovalneeded.com and Sylvie & Scott from Ditchthemap.com. As Ecuador is a coastal country in the tropics, you can be sure that you can find some great beaches. Los Frailes Beach is one of the country’s favorites. Located near Puerto Lopez, you can find this very scenic beach for white sand, nature trails through the forest, and some different birds, including the famous blue footed boobies. The white sandy beaches are surrounded by dramatic cliff scenery and tropical dry forest. You can enjoy visiting the mirador or lookout point for some fantastic views of the ocean and coastline. Los Frailes Beach is located inside the National Park of Machalilla. There is a two hour walk leading to Los Frailes, which passes through the beautiful black sand beach of Playita Negra then to the lookout point and finally ends at the beautiful Los Frailes. Some travel bloggers who visited Los Frailes Beach are Andrew & Emily from Alongdustyroads.com, Barbara from Holeinthedonut.com, and Bob from Pirancafe.com. One of the most significant and largest sets of Inca ruins in Ecuador, Ingapirca means the ‘Inca wall’ with the main building known as the Temple of the Sun, which was designed and built with incredible precision. The stones were cut in such an exact way that sunlight will shine through the central doorway at the top of the temple on the solstices. Although the ruins are not as grand as neighbouring Peru, the site still offers a fascinating look at the Inca expansion into Ecuador with their iconic building style and remarkable engineering ability. Originally, the site was inhabited by the Cañari people but were pushed out by the Inca after a long battle at the end of the 15th century. Later on, because of respect earned by the Cañari, both civilizations worked out a way to cohabit the same region. The conquistadors arrived in Ecuador before the Inca could finish the city. The Spanish looted what they could and used many of the stones to build their own churches and colonial buildings in other cities, such as Cuenca. Today, a lot of the area has been reduced to its foundations but the Temple of the Sun remains, which provides an interesting point to look over the surroundings imagining the experiences of the Incas. Some travel bloggers who visited Ingapirca are Bryan & Dena from Gringosabroad.com, Cathy from Cathyflewthecoop.com, and Cristina from Justnotthatway.com. Located south-west of Quito, Guayaquil is a fantastic colonial city and the second largest city in Ecuador. Guayaquil offers beautiful architecture, fantastic restaurants and bars, and an interesting history. You can also find a great arts scene, fantastic nightlife, and many different city parks and squares. One of the most loved is the Parque el Centenario positioned in the center of the city. The park is dotted with different bronze monuments representing the ideals of Guayaquil. Founded by Francisco de Orellana, Guayaquil sits on the Guayas River and is one of South America’s main port cities. The malecon or riverfront promenade is one of the city’s favorite destinations, which is where you can find many of the fantastic restaurants, interesting museums, sculptures, bars, and shops lining the walkway. The ultramodern walkway is probably the most focussed renovation on creating a nice environment for tourists in the whole of South America. Although, this is also a much loved spot for locals as well. Because of it’s location and hub of activity, Guayaquil was frequently raided by pirates during colonial times who would take anything they could carry, including the local women on many occasions. Some travel bloggers who visited Guayaquil are Sebastian from Sebastianlipp.com and Barbara from Holeinthedonut.com. A very scenic and deep lagoon to visit located just a little north of Quito, Laguna Cuicocha sits in the cordillera of an extinct volcano and formed after a big eruption over 3,000 years ago. The lake is home to two islands made of solidified lava. You can enjoy hiking around the crater’s rim for fantastic views and cruise on the lake itself within the volcano. The name stems from the lake’s shape as indigenous people felt the water was shaped like a guinea pig, which is why the translation of Laguna Cuicocha is the ‘lake of the guinea pig.’ Guinea pigs are an important food for indigenous people throughout the Andes and along with the camelids are South America’s only domesticated animals. The hike around the caldera takes about 5 hours and provides excellent views both of the caldera itself and the surrounding scenery. Surrounding the caldera are a few different volcanoes, including Imbabura, Cayambe and Mojanda. The eruptions of these volcanoes created the fertility of the valley and show why Ecuador really is the land of volcanoes. A travel blogger who visited Laguna Cuicocha is Angela from Notyouraverageamerican.com. A 2200 hectare island in the middle of the Guayas River, Santay Island can be reached from Guayaquil. You can enjoy a boat trip to the island from this fantastic colonial city. A testament to conservation, Santay Island is a highly diverse wetland where you can enjoy the mangroves and many wildlife sightings. On the island you can see many different birds, including many threatened species, reptiles, such as the famous iguanas, and different fascinating snakes and mammals. You can enjoy many different trails leading around the island that connect to restaurants, accommodation options, and a ranger’s station. Although a small population lives on the island itself, the majority of the island is dedicated to nature. Not only a fantastic area for wildlife, Santay Island helps filter and clean the air from the city and provides an important ecological service. A travel blogger who visited Santay Island is Angela from Notyouraverageamerican.com. Officially known as Parque Seminario, this a small city park but is definitely worth a visit when in Guayaquil. You may think this is just like any other attractive city park until you look to the trees or notice some movement from the corner of your eye. What sets this park apart and makes it unique are the abundance of free roaming iguanas. Iguanas are almost everywhere, from the trees to the park benches. Not only full of iguanas, the waterways are full of turtles and fish and squirrels from the surroundings are frequently seen jumping around the branches. The park is loved by visitors but is also a favorite place for locals as well. There are many places to buy some snacks or an ice cream while you wander the park looking at the animals. A travel blogger who visited the Iguana Park is Sue from Traveltalesoflife.com.